1. ONLINE RESOURCES, APPS, AND HOTLINES CAN HELP VICTIMS GET LEGAL INFORMATION AND HELP QUICKLY. When beginning to build a case against an abuser, many survivors of domestic violence do so without the help of an attorney. For this reason, access to legal information is crucial. 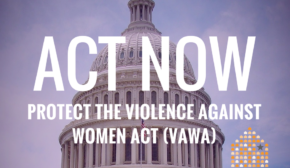 WomensLaw.org was founded in 2000 to use the power of the Internet to aid survivors of domestic violence by providing state-specific, “plain language” legal information and a wide range of legal resources for survivors. Check out other resources and apps on NNEDV.org. 2. 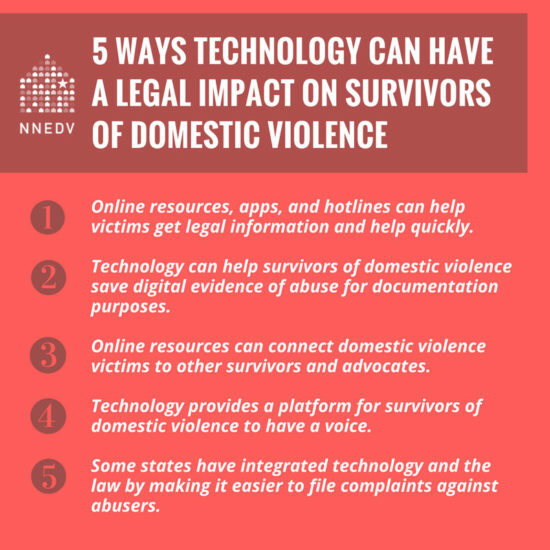 TECHNOLOGY CAN HELP SURVIVORS OF DOMESTIC VIOLENCE SAVE DIGITAL EVIDENCE OF ABUSE FOR DOCUMENTATION PURPOSES. Many legal proceedings may require survivors to provide a judge with evidence of abuse. This evidence often includes photos, text messages, emails, or social media posts. When survivors are considering documenting abuse, it is important to consider ways that this information can be accessed or shared. Visit TechSafety.org for more tips on documentation. 3. ONLINE RESOURCES CAN CONNECT DOMESTIC VIOLENCE VICTIMS TO OTHER SURVIVORS AND ADVOCATES. 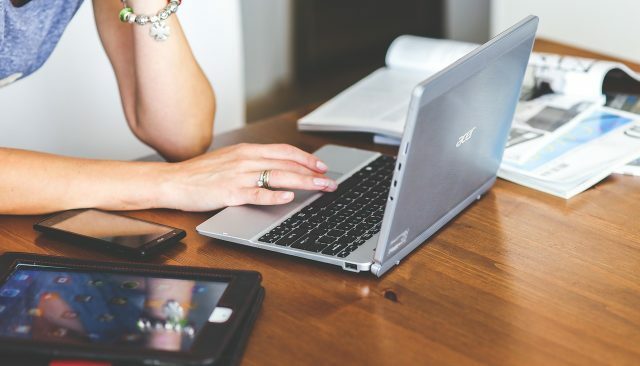 Online support groups, chat rooms, and message boards can help survivors connect with people who have experienced similar situations. Programs like After Silence and YesICAN provide an online safe space for individuals to discuss domestic violence and sexual assault. There are similar programs available to provide specific support groups for teens and Americans overseas. 4. TECHNOLOGY PROVIDES A PLATFORM FOR SURVIVORS OF DOMESTIC VIOLENCE TO HAVE A VOICE. Social media outlets like Twitter, Facebook, and Instagram can help circulate resources for victims of domestic violence and provide a community of support, and hashtags like #WhyIStayed and #WhyILeft amplify these conversations. Though, it is important to note some of the safety implications when posting on social media, it can be used as a powerful tool for prevention. 5. SOME STATES HAVE INTEGRATED TECHNOLOGY AND THE LAW BY MAKING IT EASIER TO FILE COMPLAINTS AGAINST ABUSERS. A few state courts, like Idaho and New York, have begun to improve systems for filing a request for a protection order, and are using the Internet to do so. New York recently passed legislation to implement a pilot program that will allow victims to electronically file a petition for a temporary order of protection and allows judges to issue an order of protection by audio-visual means, without the victim physically present in the courthouse. To learn more about state laws and statutes, visit WomensLaw.org. 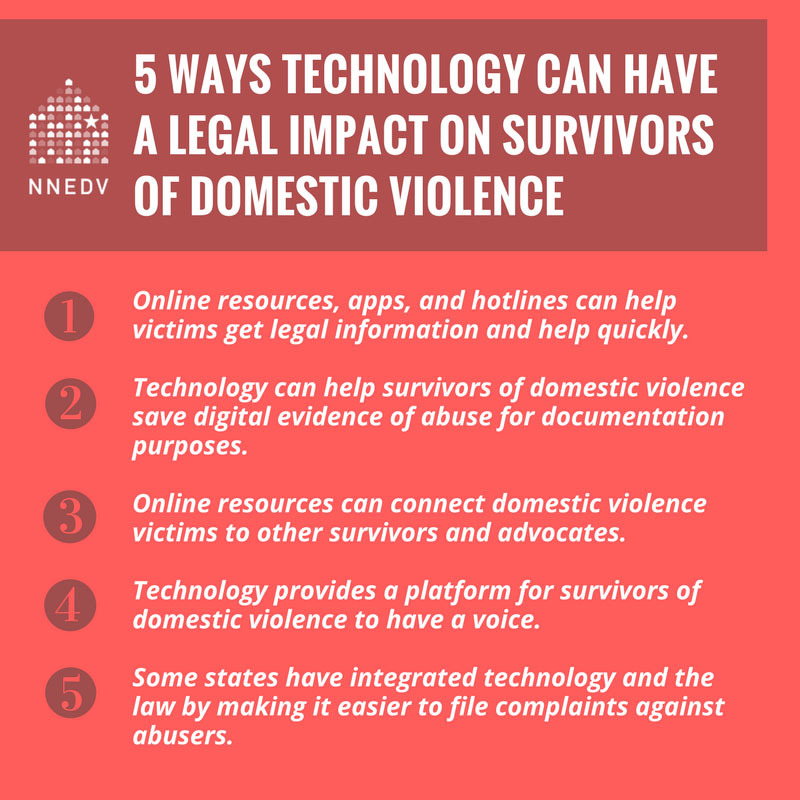 Technology can aid in giving survivors of domestic violence helpful information that they otherwise may not be able to access. It is our duty to hold offenders accountable, to educate victims about technology, and to empower survivors to regain power and control over not only their daily lives, but their digital lives as well.